Win Rosalique this National Rosacea Awareness Month! If you suffer from skin discolouration and pigmentation, then Rosalique is the perfect product for your skin! This Bio-scientific solution for sensitive and red skin has a three-step method that conceals, treats and protects with UVA and UVB protection and SPF 25.Use alone as a 2-in-1 face cream to instantly improve the appearance of the skin, or as an effective base or primer under makeup and allow anti-oxidant rich minerals, moisturisers and pro-vitamin B to protect the skin. Rosalique is dermatologically and clinically tested. Cruelty free and vegan friendly. 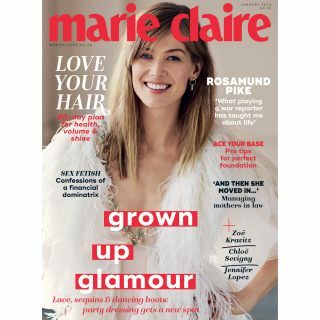 Enter Code MARIECLAIRE on our website at check out to receieve 20% discount. Rosalique is the only product in the world to offer a triple action effect, conceals instantly, treats gently and protects long term. The first step conceals, delivering ultra-fine micro encapsulated balls that are green on the outer edge to initially neutralise skin mask redness and unevenness. The second step, gentle treatment, offers bio-clinically active ingredients that will reduce inflammation and redness whilst further soothing and calming irritated skin. The third and final step, long term protection, is found in the formula by way of UV filters that protect from both UVA and UVB sun rays. While, the SPF 25 offers protection so that skin is less agitated and irritated from long-term skin damage that sunlight UV rays can cause.